Playtech‘s range of slots from the Marvel stable of superheroes is surely one of the greatest things about playing online slots; there are dozens of Marvel slots available, each based on a different superhero and each game is hooked up to Playtech’s progressive jackpot network. Blade is of course based on the comic book, the movie and then the TV series of the same name and features the eponymous vampire hunting superhero as he seeks to rid the world of his enemies. 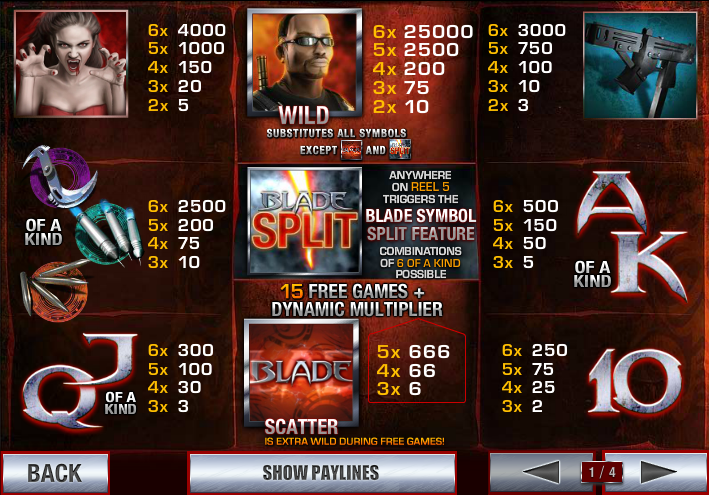 This online slot is a five reel, twenty payline machine and it sticks with the look of other Marvel slots. All the symbols are Blade-related and even the standard 10, J, Q, K and A have a knife-like, red-tinged quality to them. The remaining symbols are Blade’s important syringes, bullets, his weapon, a gun, Blade himself and a female vampire. 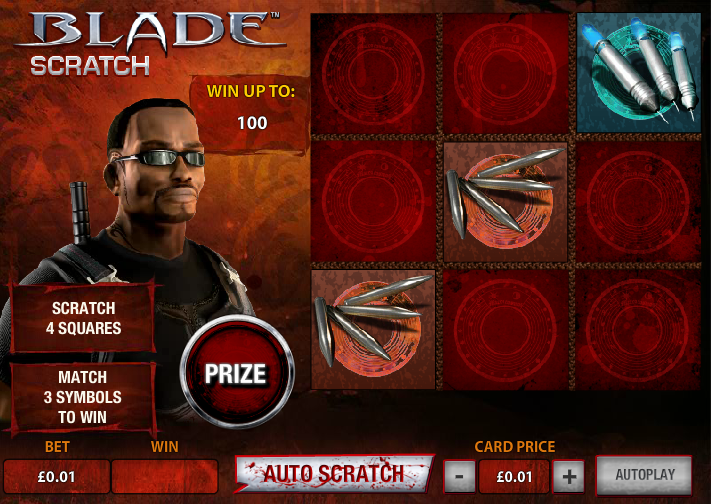 Blade is the wild symbol, there’s a Blade ‘split’ symbols and the scatter symbol is the game’s logo. To trigger this bonus feature you need to land a winning combo and also land the Split symbol on the fifth reel; the final symbol on the combo will then be cut in two, effectively adding an extra identical symbol to the reels and increasing your winning chances. Spinning three or more scatter symbols anywhere on the screen will win you a profitable fifteen free spins. You start the round with a random multiplier of between 2x and 5x and each time you spin a win that increases; fail to win and it drops back one to a minimum of 2x. During this free spin round it’s possible to win more free spins indefinitely. Every spin of a Marvel slot makes you eligible for a shot at the progressive jackpot; the higher your stakes the more chance you have of randomly activating the jackpot game. You are then guaranteed a win from the following jackpots: Power, Extra Power, Super Power and Ultimate Power. Blade maintains the high standards of the Marvel series with some great animations of the man in action, especially when the split is activated. 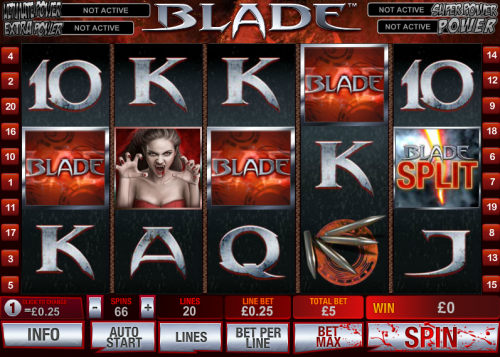 You can play with as little as £0.01 on one payline or splash out with £200 per spin with everything maxed out.